This second floor apartment has 5 grand dual aspect sash windows with balcony overlooking the Hoe and Plymouth Sound. The very spacious lounge includes an open plan walk around well equipped kitchen and dining areas. Luxuriously furnished including a velvet Chesterfield sofa which doubles as a very comfortable sofa bed for 2 people, the main double bedroom includes an ensuite bathroom with shower over and the twin bedroom has a shower room. Well equipped with technology you can voice activate the lights and heating/hw, use our electronic concierge service and use the services of Alexa including unlimited songs or enjoy watching tv in every room. Discover Plymouth - Britain's Ocean City - for an authentic Devonian experience and indulge in the maritime heritage, captivating coastline and endless activities. With No.1 Elliott Terrace being on Plymouth Hoe overlooking Plymouth Sound, proclaimed to be “one of the world’s finest natural harbours,” this central spot has an unparalleled location to enjoy the splendid ocean views with constantly changing activity both on Plymouth Sound and the Hoe, whilst being a stone’s throw away from the vibrant city. 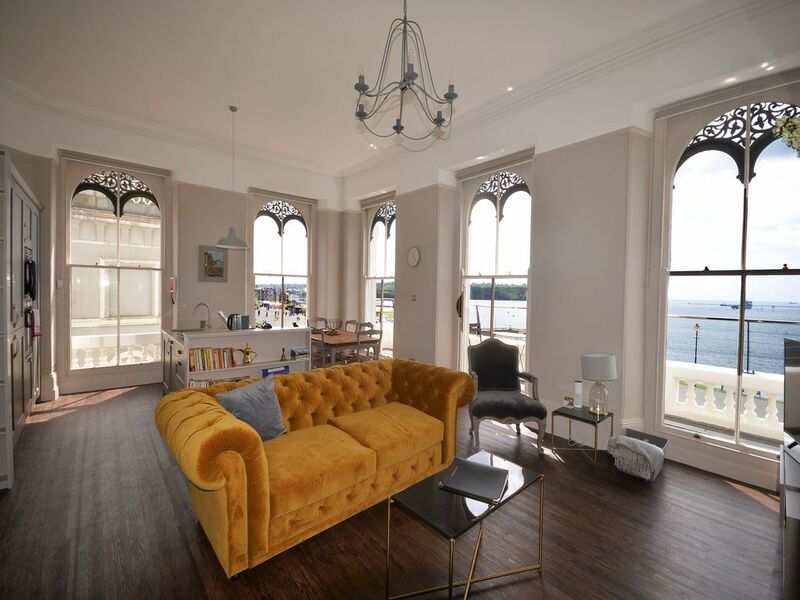 The apartments are within a fine Grade 2* listed palatial Italianate building with dual aspect windows giving fabulous views to the east and south. Whilst being in the heart of the culture, immerse yourself in the historical attractions, natural stunning scenery and an increasing choice of good restaurants. Plymouth boasts a multitude of attractions which can please everyone in the family, from constantly changing events on the Hoe, dramatic coastal walks, cultural attractions and shopping in the city or the numerous surrounding towns and villages. Whatever the weather, you will without a doubt be overwhelmed with options to entertain you and your group. Elliot Terrace is bursting with history with previous residents including the Astors – then one of the richest families in the country – with Nancy Astor being the country's first woman sitting MP residing at No 3 and Arthur Conan Doyle at No 6. Previous visitors include the King and Queen, Winston Churchill, George Bernard Shaw and Charlie Chaplin. If you’re interested in going further afield check out our sister apartments www.plumholidays.co.uk – special deals available for two centre holidays in South Devon and further afield in exciting coastal locations! A large 90sqm second floor apartment with stunning panoramic south and east facing views over the Hoe and Plymouth Sound from a large lounge with high ceilings, 5 large dual aspect sash windows, well equipped kitchen, double bedroom with kingsize Hypnos bed, twin bedroom with Hypnos beds, bathroom with shower. Free fast wifi and parking. New refurbished in with traditional features retained with contemporary designer interior and furnishings. Lovely accommodation, clean, spacious. Prime location for city centre/sea front. Stunning views! Great week spent mostly watching activities in the bay and on the Hoe from the apartment balcony. Well equipped kitchen, open plan excellent. Bedrooms comfortable and overall a great experience. Would definitely return. Hi had a great Stay, I would love the bed to be a king size as the double for me is two small for comfort. my wife commented on the lack of a full size mirror, apart from Bathroom and Kitchen being needing to be Refurb. Fantastic location, perfect for a 1 night! The apartment is huge so feels very spacious! Beds were extremely comfortable, would definitely stay here again! Die Wohnung machte auf den Bildern einen wunderschönen Eindruck. Was sich auch bewahrheitet hat, war die eczellente Lage, der unvergleichliche Blick und die Hausmeisterin war sehr hilfsbereit und zuvorkommend. Leider waren wir vom Zustand der Wohnung nicht angetan. Das Interiör, gerade in Küche und Bad, war im schlechten Zustand. Eine Jalousie war im Wohnzimmer aus der Wand gerissen. Wasserhahn im Badezimmer nicht festgeschraubt. Zunächst fehlte der Duschvorhang. Zwei Schlafzimmer, aber nur in einem ein kleiner Schrank. Schubladen und Schranktüren in der Küche schief. Möbel die auf den Bildern zu sehen waren, wurden teilweise durch andere, nicht so hochwertige, ausgetauscht. Im Vergleich zu manch anderem B&B war die Wohnung letztendlich zu teuer. The appartment is very spacious and the view absolutely stunning! We could have sat in the living room and watched Plymouth Hoe for hours. Parking is directly nearby. Everything is clean and the exchange of the keys and communication with the landlord went smooth and without problems. Had asked for ground floor and I had no notification that this wouldn't be one.I have scoliosis of the spine and 5 lots of stairs not good.It was my 60th birthday treat as I wouldn't pay this amount for an apartment and was sorely disappointed with the condition of the place.Fridge was broken and the more likely you left had gone off the next day,the basic cleaning was done, kitchen floor sticky and not swept, apartment hadn't been hoovered and just very dull and not inviting for a holiday.The real gut buster was no shower curtain !! I know improvements were going on all around but no one around to clear the hall and stairs so very grubby.Best bit sheets, towels were good quality and clean.Wasnt informed that MTV crashes was on this week so this was very noisy and not all areas accessible.I believe that I should have some of my money refunded, a very angry customer. I am very sorry this guest wasnt satisfied but we had no request for another floor nor was a call made about cleanliness during the stay. We do stress the importance of reporting any problems immediately so they can be dealt with straight away. 1 Elliot Terrace is located in the centre of the Hoe overlooking Plymouth Sound and almost uniquely has dual aspect views. It is a short walk to the many cafes and restaurants in the area, a few minutes walk to the Barbican and town centre.